You are here: Home / Safety / Rana Plaza / Pay Up! The collapse of the Rana Plaza factory building in Bangladesh is the worst ever industrial accident to hit the garment industry. On April 24, 2013, the Rana Plaza building came crashing down, killing 1,134 people and leaving thousands more injured. People all across the world looked on in shock and horror as media reports poured in revealing the true extent of the human toll. There were harrowing stories of survival, of people who had no choice but to amputate their own limbs in order to be freed from the rubble and survive. At least 29 global brands had recent or current orders with at least one of the five garment factories in the Rana Plaza building. Each of these brands was a complicit participant in the creation of an environment that ultimately led to the deaths and maiming of thousands of individuals. Nearly two years since this disaster, the suffering continues for the survivors and families of the dead as they are forced to wait for compensation – compensation, which is an entitlement and was promised by so many. It is true that no amount can make up for the loss of a loved one or the resulting physical and emotional scars inflicted on those who survived such a tragedy. But what is also true is that the survivors and victims’ families should be compensated for the financial and medical losses they sustained as a direct result of the disaster. The families of those affected by the Rana Plaza collapse are owed $30 million in compensation. All brands in Bangladesh should contribute according to their ability to pay, the size of their relationship with Bangladesh and their relationship with Rana Plaza. Which brands have contributed to the fund? Bonmarché, C&A Foundation, Camaïeu, El Corte Inglés, Inditex, KiK, Loblaw, LPP S.A., Mango, Mascot, Premier Clothing, Primark and Walmart and The Children's Place through BRAC USA. But nearly all of these brands have failed to make a significant enough contribution and we are calling on them to increase their donations immediately. N Brown Group, VF Corporation, Hudson Bay Company, Next and The Gap have also made contributions as brands who source from Bangladesh, but had not had a sourcing relationship with Rana Plaza. Find out which brands still needs to Pay Up! Benetton is the last major international brand with undeniable links to the factory, which contributed 1.1 million, not nearly sufficient. Read more about their contribution here. There is irrefutable evidence exposing their direct link to Rana Plaza – photographs of the Benetton label in the building rubble, and documentation of order forms from the New Wave Factory in the Rana Plaza building. Following initial denials from the company in regard to their link to Rana Plaza, they have now publicly acknowledged that New Wave Style was a supplier for Benetton. Benetton’s behaviour is a complete disgrace and the time for excuses has long since passed. 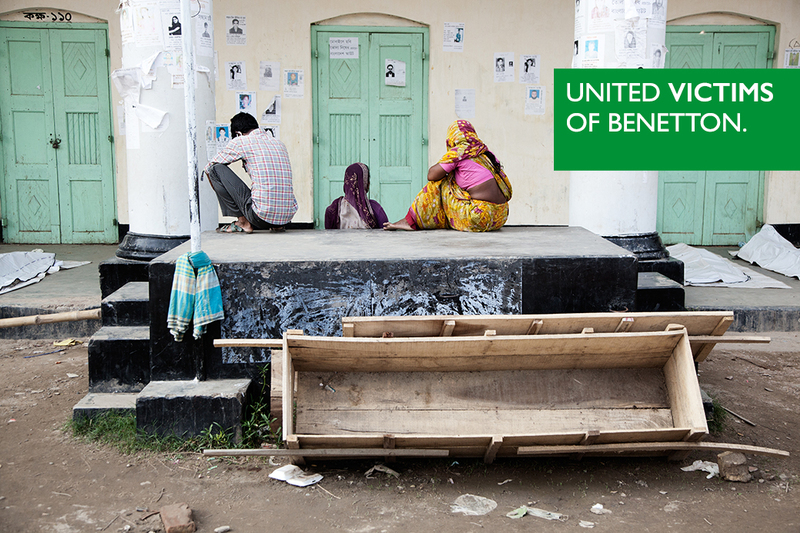 Join the Benetton PayUp Campaign and act now to ensure justice for the victims of Rana Plaza! Please tweet "@Benetton please #payup for the victims of #RanaPlaza it is long overdue! #cleanclothes"
Still Waiting a report looking at the lack of compensation paid to victims of Rana Plaza and Tazreen Fashions. Hear more about Shila's story, one of the women featured in the film here.